I have hearing impairment that means I hear sounds, and especially speech, muffled and boomy - as if there is too much bass and no treble. This means that I cannot understand what people are saying when they phone me, nor can I listen to the radio or other speech media on my phone. I do not listen to music on my phone. I definitely do NOT want bass boost and I do not need increased volume. I want a simple equaliser that enables me to cut out the bass and boost the treble, for all sound that comes from my iphone into my earphones. All of the many equalisers that I have seen in the App Store are music players that just play music you have stored on your phone (I don't have any). They do not change the quality of the speech in received phone calls or on live radio. Any suggestions will be very welcome. Welcome to iMore. Thanks for joining. Have you tried a different search in the Apple App Store. I just searched Hearing Aid and about 4/5 came up. These are separate from Music apps. Enjoy the iMore Forum. You can try a few apps, but it sounds like you have already. Unfortunately though, Apple doesn’t allow apps to make system level changes. Thank you for the suggestion. The hearing aid apps use the phone's microphone to pick up and enhance sounds external to the phone - eg people talking in the same room as you, or your tv etc. They do not affect any sound generated within the phone, eg someone phoning you, or listening to the radio on your phone. It's a pity that they don't do this. I find that people with hearing impairments are ignored in a big way right across the spectrum of life. Most organisations say "call us" without giving a non-voice method of contact. When you fill in on-line forms you must give a phone number - no choice. iPhone (for example) doesn't make any allowance for people who cannot hear clearly on the phone, yet the technology exists for this, and it is not complicated; people who can phone organisations can get things sorted immediately - if you email they can take days or weeks to reply, if ever. My local council says they will answer emails in 7 - 10 working days. Useless if you have an emergency. Unfortunately iMore is not Apple and we don't have a say in the development of the iPhone. I wish we did..LOL. 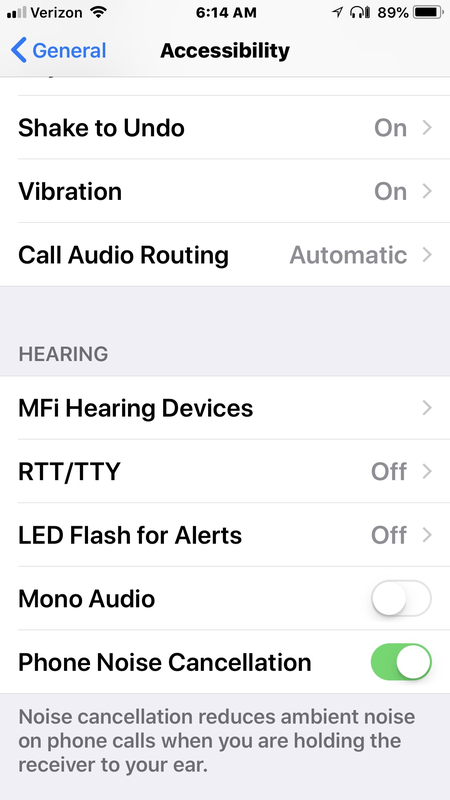 The only thing I found on the iPhone for hearing impairment was under settings, general, accessibility. Not sure this will help or if you've tried it. Have you tried headphones with an in-line equalizer? Just a thought but it might work. Search Amazon for “headphone equalizer”, several show in the search results to chose from. Probably best to combine with a good set of over the ear headphones.